Hunter Hayes, Keith Urban and Vince Gill have been announced as performers for The 46th Annual CMA Awards. Gill will perform with previously announced CMA Awards Female Vocalist of the Year nominee, Kelly Clarkson. The CMA also revealed the first round of artists presenting trophies during the three-hour event will include Martina McBride, Kellie Pickler, Sugarland, and The Band Perry. Additional presenters include Connie Britton, Hayden Panettiere, Jake Owen, Jana Kramer, Kimberly Williams Paisley, Lisa Marie Presley, Reba McEntire, and Tim Allen. Previously announced performers include Jason Aldean, Dierks Bentley, Luke Bryan, Kenny Chesney, Eric Church, Clarkson, Eli Young Band, Brantley Gilbert, Faith Hill, Lady Antebellum, Miranda Lambert, Little Big Town, Tim McGraw, Brad Paisley, Blake Shelton, Taylor Swift, The Band Perry, Carrie Underwood, and Zac Brown Band. 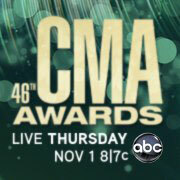 The 46th Annual CMA Awards will air live from Nashville’s Bridgestone Arena, Thursday, Nov. 1, 7 pm/CT on ABC. Further details are available at CMAawards.com.